From six different settings, you’ll meet characters you feel you’ve known your whole life, who’ll make you laugh one minute and cry the next. THIS IS A SEASONAL ITEM LIMITED STOCK FOR LESS THAN CASE LOT SALES. IF YOU DESIRE CASE LOTS OF 24, PLEASE CONTACT US ABOUT PLACING AN ORDER. 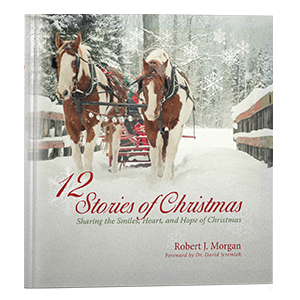 Even though he has two million copies of books in print, Robert J. Morgan writes only one short story each year-an original work to share with his church on Christmas Eve. These Christmas stories are now available in one beautiful volume for your own enjoyment. You’ll meet a shy, bookish boy who finds himself center stage in the Christmas pageant, a Pennsylvania family whose car disappears on December 24th, and a mountain man trapped in a blizzard with his grandson on Christmas Eve. From six different settings, you’ll meet characters you feel you’ve known your whole life, who’ll make you laugh one minute and cry the next. So this year, and the years to follow, gather your family and experience the true spirit of love at Christmas through this timeless gift of story.